A single adventure-filled tour takes you to three top Canary Islands attractions on La Palma. 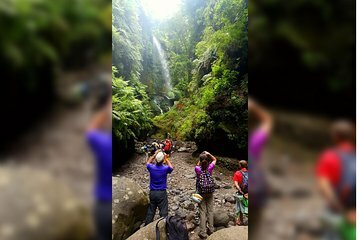 Hike through tunnels to the Marcos y Cordero springs, ride a 4x4 to Los Tilos Forest, and swim in the natural pools of Charco Azul—all easily managed under a single booking and done with the safety and expertise of a guide. There is no exact meeting point. Customers should specify whether they wish to be picked-up at the Tourist Information Office in Los Cancajos, or at the Hotel Princess in Fuencaliente. Minimum age for this activity is 12 years. Underage customers should be accompanied by an adult. All customers should wear comfortable walking clothes and bring water, and a raincoat. It is recommended to bring swimsuit, flips flops, sunglasses and sunscreen. The excursion would not take place if the minimum of 2 customers per booking is not reached.